A behavioral intervention designed to increase the postural tone of the abdomino-thoracic wall is effective treatment for abdominal distention of no detectable cause, researchers report in a randomized controlled trial published in the December issue of Clinical Gastroeneterology and Hepatology. Changes in abdominothoracic muscle activity at the end of the third treatment session vs the pretreatment distention session. Biofeedback significantly modified the activity of abdominothoracic muscles whereas placebo had no effect. Abdominal distension is one of the most common complaints among patients seeking care from a gastroenterologist. Most patients have no detectable cause for the distension, but meet the diagnostic criteria for functional bowel disorders, such as irritable bowel syndrome or functional dyspepsia. Abdominal distention usually occurs after meals and disappears after an overnight fast. The sensation corresponds to visible abdominal distension and increase in girth. In patients with functional gut disorders, abdominal distention does not produce a substantial increase in intra-abdominal volume—instead, it involves dystony of the abdominothoracic walls and redistribution of content. Episodes of abdominal distention were associated with thoracic insufflation and an increase in diaphragmatic tone, driving contents downward, coupled with reduced tone and ventral protrusion of the anterior wall. 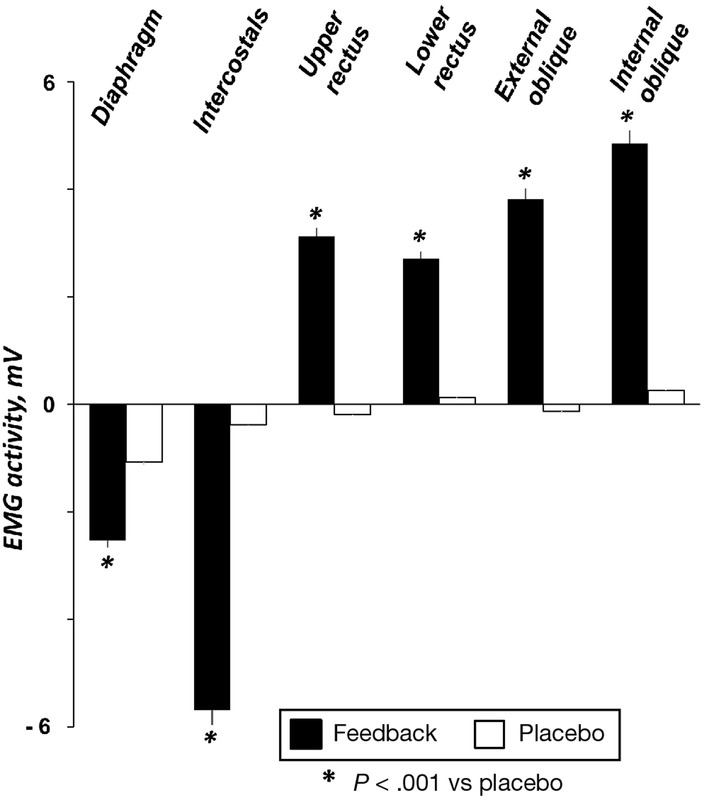 Elizabeth Barba et al developed a complex biofeedback technique based on electromyography (EMG)-guided control of abdominothoracic muscular activity. In this technique, patients are taught to reduce the activity of intercostal muscles and the diaphragm, while increasing the activity of the anterior abdominal muscles. Barba et al studied the effects of this technique, compared with placebo, in 48 patients with visible abdominal distention who fulfilled the Rome III criteria for functional intestinal disorders. The patients in the biofeedback group (n=24) were shown the signal and instructed to control muscle activity, whereas patients in the placebo (n=22, final) received no instructions and were given oral simethicone. Each patient underwent 3 sessions over a 10-day period. The primary outcomes was subjective sensation of abdominal distention, measured by graphic rating scales, for 10 consecutive days before and after the intervention. 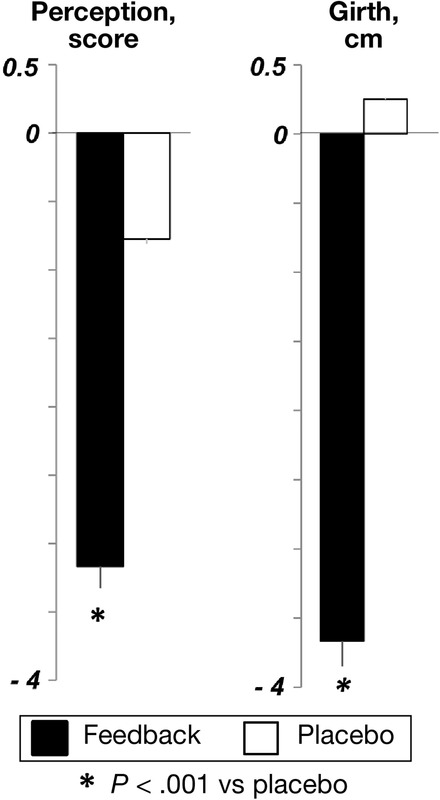 In all patients, abdominal distention was associated with reduced EMG activity of the anterior wall muscles (consistent with girth increment and protrusion of the anterior wall), increased EMG activity of the diaphragm (consistent with a diaphragmatic descent), and increased EMG activity of intercostal muscles (consistent with costal wall expansion). All patients in the biofeedback group learned to correct their postural tone. Biofeedback significantly modified the activity of the abdomino-thoracic muscles, whereas the placebo had no effect (see figure). Patients in the biofeedback group were able to reduce intercostal activity (reduced by a mean 45% ± 3%), but not patients in the placebo group (reduced by a mean 5% ± 2%). Patients in the biofeedback group also learned to increase anterior wall muscle activity (by a mean 101% ± 10%), but not in the placebo group (decreased by a mean 4% ± 2%). Biofeedback resulted in a 56%±1% reduction of abdominal distention (from a mean score of 4.6±0.2 to 2.0±0.2), whereas patients in the placebo group had a reduction of only 13% ± 8% (from a mean score of 4.7±0.1 to 4.1±0.4). What were the effects on symptoms? Associated abdominal symptoms were reduced by 57%±9% in the biofeedback group and by 23%±4% in the placebo group. The effects of treatment did not depend on the type of associated symptoms, and no side effects were reported. The 19 patients who did not improve with placebo treatment subsequently received biofeedback treatment. The effects of biofeedback in these patients were similar to those in the initial biofeedback group during the treatment sessions (the EMG activity change, girth decrease, and improved sensation of abdominal distention) and afterward. The findings show that abdominal distention is a real phenomenon that is not related to an increase in intra-abdominal content, but rather to abnormal postural tone. Furthermore, abdominal distension can be effectively corrected by biofeedback-guided control of abdomino-thoracic muscular activity. Barba et al explain that under normal conditions, the walls of the abdomen adapt content by continuous modulation of muscle postural tone in the anterior wall, the diaphragm, and the chest (called abdominal accommodation). An increase in abdominal content, such as by meal ingestion, induces a contraction of the anterior wall, along with relaxation and upward shift of the diaphragm to accommodate the ingested volume without major changes in girth. The costal walls also move upward to compensate for the diaphragmatic ascent. Abdominal distention is caused by a faulty abdominal accommodation—the fact that conductual therapy corrected abdominal distention indicates that the abnormal postural tone is a behavioral somatic response. Using the biofeedback technique, patients effectively learned to control abdominothoracic muscular activity; corrected postural tone was associated with a reduction in girth back to baseline levels. It is still not clear how patients acquire this abnormal behavior or what factors induce the postural response. It could be anxiety or stress. Perception of digestive symptoms, such as post-prandial fullness, in patients with functional dyspepsia might induce an abnormal somatic response. Biofeedback treatment reduced associated symptoms, indicating that they are secondary to distention. Further studies are needed to validate simpler techniques for widespread application in patients with abdominal distension.